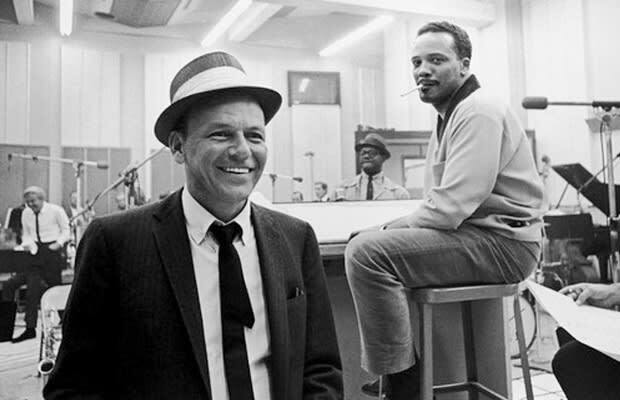 Q and Count Basie collaborated with Sinatra on his swinging 1964 single “The Best is Yet to Come,” which was also the last song he ever sang in public. They also recorded the definitive version of “Fly Me To The Moon,” which became the first song ever played there. “Frank’s one of the best ever,” Q told Malone, “in terms of pitch and identification and style and phrasing. Lyrically he was like an actor. He could take a lyric and make you believe anything. When we did 'Fly Me To The Moon' that song was originally called 'In Other Words.' A lot of other people had recorded it, but when Frank finished with it, the most repeatable line was "Fly me to the moon." Later I met Buzz Aldrin, you know, the dude who walked on the moon. He said, "When we landed on the moon, I reached back in the cabin and pit on the cassette with you and Basie and Frank." According to his 2001 autobiography, Quincy spent a lot of time with Sinatra in his last days, “…sitting by his bed as Alzheimer’s took its toll. One day he impatiently demanded coffee with cream and sugar. When the nurse came in with the coffee on a tray, he took one look at it and said, ‘What are you bringing me that for? You know coffee makes me nervous.’ She backed out of the room.